WASHINGTON (Kyodo) — Japan and the United States were at odds Thursday over trade policy, with Tokyo calling for a U.S. return to the Trans-Pacific Partnership and Washington pushing for a bilateral trade deal. Speaking to reporters after meeting with U.S. Trade Representative Robert Lighthizer for the first round of ministerial trade talks in Washington, Toshimitsu Motegi, Japan’s economic revitalization minister, said the two sides will continue talks on Friday. During Thursday’s session, Motegi told Lighthizer that Japan believes the TPP — an 11-member regional trade pact from which the United States withdrew last year — is the best trade deal for the two countries. Motegi quoted Lighthizer as saying Washington would like to promote trade negotiations bilaterally with Tokyo. Motegi did not say whether Lighthizer pushed for a bilateral free trade agreement. "We had a candid exchange of opinions. We were able to deepen our understanding on each other’s positions and views," Motegi said. "I will meet (Lighthizer) again tomorrow to deepen our discussions." Motegi declined to comment on whether Lighthizer pushed Japan to further open its automobile and agriculture markets to reduce the chronic U.S. trade deficit. The Japanese official said he cannot reveal details about the negotiations. The talks came as U.S. President Donald Trump has threatened to impose additional tariffs of up to 25 percent on imported cars and parts. If he follows through, the new duties would significantly impact major car exporters such as Japan. Lighthizer was believed to have urged Motegi to reduce Japanese tariffs on agricultural imports such as beef and soybeans, and remove nontariff barriers on automobile imports, in an effort to extract concessions ahead of the U.S. midterm elections in November. Speaking at a Senate hearing last month, Lighthizer said, "We have had a chronic trade deficit with Japan and we have had, in that case, what we consider to be unfair barriers to U.S. exports in a number of areas." 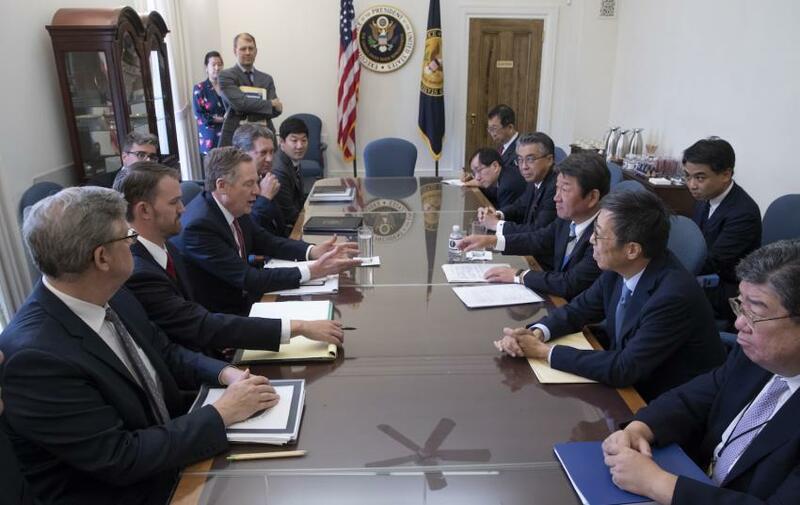 In the July 26 hearing at the Appropriations Committee, Lighthizer reiterated his eagerness to start negotiations for a U.S.-Japan FTA, something Tokyo would like to avoid as its preference lies with the TPP. "We ought to be negotiating an FTA with Japan," he said, in reference to Trump preferring to handle trade issues bilaterally. In line with an agreement between Japanese Prime Minister Shinzo Abe and Trump during their summit in April in Florida, Motegi and Lighthizer are tasked with leading new consultations on trade and investment for a "free, fair and reciprocal" trade deal.